One thing you may be sure of with a Rossini opera – you are going to be entertained. The first and last rule of Rossini performance (as with Mozart) is to make sure you get out of the way of his transparently clear objective. It speaks for itself. All attempts at “interpretation” will only muddy the waters and fail to deliver the promised goods. So where your Rossini experience is populated by interpreters, your entertainment will be hijacked. That is scarcely the composer’s fault. But if you are unlucky enough to encounter such hijacking, leave the experience at once and report the criminals to the nearest police station. You will, of course, be creating your own Rossini farce by doing this. Entirely in the spirit of the Maestro. Rossini was only twenty when he enjoyed the unqualified success of his one-act farce, La Scala di Seta at the Teatro San Moïsè on May 9th, 1812. The theatre is small and there is no chorus and an orchestra of only strings, double woodwind plus two horns and the continuo player (Rossini himself). This player needs to be able to improvise during some of the gags, and the ROF had the inspired idea of performing it on a fortepiano – an instrument which never quite manages to be in tune, thereby delightfully reproducing the effect of a pub piano and adding to the farce in a Chaplinesque way. Ever respectful of authenticity, Pesaro posters and programmes informed us this is a farsa comica in un atto di Giuseppe Foppa, musica di Gioachino Rossini. They then proceeded to introduce an interval at half-way point. Why? All the mischief and romp of the first part was then broken. In fact, the second part had horrible moments of stodginess. And stodge is alien to farce, Rossini or otherwise. What should have been an hour of uninterrupted bubbling music ran to over two, with all the missed opportunities in the slowed tempi of much of the second part. If this was a concession to some singers, it was nevertheless a mistake. Those darned interpreters again! That said, at the interval I was rejoicing that this was my lucky Rossini night. 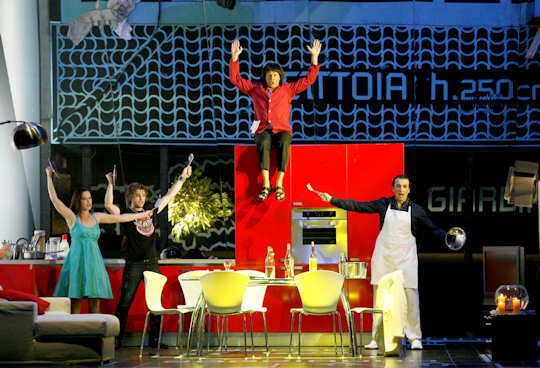 The ROF revived Damiano Michieletto’s clever 2009 production with sets and costumes by Paolo Fantin, which throughout had angled mirrors reflecting the action on the stage, giving an apt mocking double edge to the farce. José Miguel Pérez-Sierra seemed firmly in control of ideal tempi in the first part. That famous overture passage from the adagio to the vivace given to the oboe (Lorenzo Luciani) bristled beautifully with Rossini humour. All other corners were neatly turned. Why Pérez-Sierra put the breaks on so forcibly in the second part remains a mystery. The spell was broken at the uncalled-for interval and only somewhat retrieved for the extended finale. Though even here, two of its three sections were too slow to carry the wit. His rival, Blansac, was sung by baritone Simone Alberghini. It is thought that Rossini added his aria at some performance following the premiere. There is, therefore, a case for cutting it. That case was strengthened by Alberghini’s performance, which the poor chap was called on to deliver in front of the curtain, immediately following the uncalled-for interval. It went down like a lump of lead. The centrepiece of the farce is Giulia herself – Hila Baggio. This pretty sylph changed costumes three (or was it four?) times on stage and was the ideal ballet partner for Gatell. It almost seems as though Rossini has forgotten to give her an aria, and when it finally arrives it is with a feeling of an afterthought towards the end. It is cruel of the composer to hand such a demanding aria to a singer at the end of an evening and there were moments when the demands were beyond the reach of Miss Baggio. She was not helped by plodding tempi. It felt as though the whole opera had wound down. Giulia’s cousin, Lucilla, was sung by José Maria Lo Monaco. Her aria Sento talor nell’anima calls for great vocal charm, which sadly is not part of Miss Lo Monaco’s vocal makeup. It came during the annoying second part and even sounded dull in places. And that is as far removed from Rossini as you can get. The police, anyone? Paolo Bordogna (Germano) is one of Italy’s finest comic singer/actors. He played the part of Germano, the servant who Dormont (John Zuckerman) has engaged to keep an eye on Giulia. Every Bordogna movement is a musical delight. His diction is wonderfully clean and meaningful. He knows about taking farce seriously in order to deliver it. His aria – Amore dolciamente – had the merest hint of irony – just the kind of subtlety the composer requires. One final note. And I promise I am not making this up. As I was getting into the car at the end of this performance, I noticed a large shop with an illuminated sign that said IROF FUNERAL SERVICES. But I saw so many “right” things that I don’t think I would have singled out anything for this service.